Top row (left to right): 1. unidentified, 2. unidentified, 3. unidentified, 4. Lisa Eddleman. Second row: 1. Amy Walter, 2. Doug Jones, 3. unidentified, 4. Tom Powell. Third row: 1. unidentified, 2. Paula Hardiman, 3. unidentified, 4. Mrs. (Joanne) Johnson, 5. unidentified, 6. unidentified, 7. unidentified. Fourth row: 1. Dominic (? ), 2. Becky?, 3. unidentified, 4. unidentified, 5. Joe Lee. Fifth row: 1. unidentified, 2. unidentified, 3. unidentified, 4. unidentified, 5. unidentified, 6. unidentified, 7. Kristin Farar. Credits: From the collection of Jim Street. Thanks to Debbie McVay-Aldous, Lois Bounds, and Doug Jones for identifying the kids in this picture. The kids in the picture are members of the high school graduation classes of 1984, 1985, and 1986. To find other pictures of these classes in the archive, see Livermore class pictures listed by year of high school graduation. And if you have any pictures that you would like to share, please submit them to the Archive. 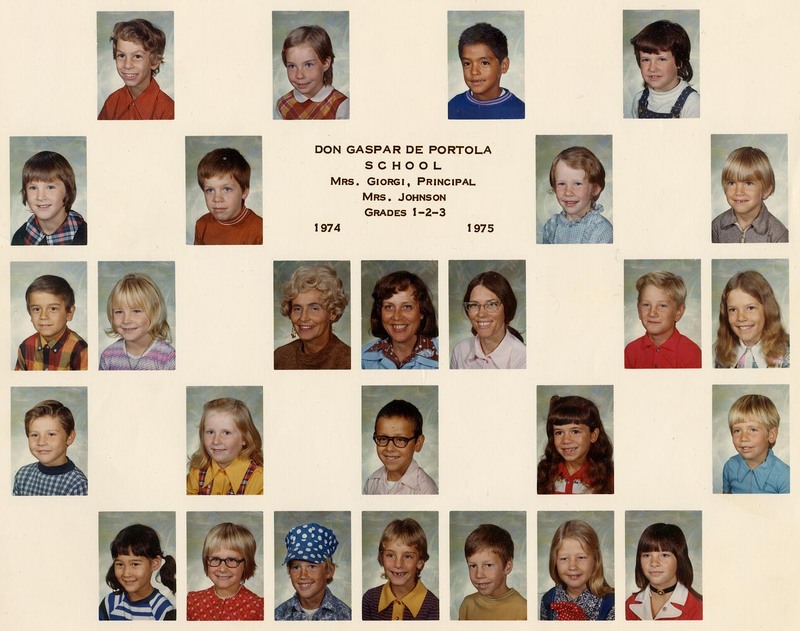 To find other pictures from Don Gaspar de Portola School in the archive, see Livermore class pictures listed by school: Don Gaspar de Portola School. And if you have any pictures from Portola that you would like to share, please submit them to the Archive.